This is not the easiest book I have ever read, stylistic I would even call it awkward. But when the world is full of simple formulaic books that are written in familiar patterns reading then something with interesting quirks that takes a different approach is both refreshing and engaging. Immortown is full of twists, which seemed a little jarring at first but which drew me into them as I read further. Until the quirks became all the more appealing. The narrative is a progression of first person memoirist viewpoints which slip between two characters. The first narrative character is Freya an actress who plays her roles almost too well. Running from a tragedy on the set of her latest film and in search of answers to the earlier one of her brother’s death. She slips between the real world and the ghostly haunted world of Immortown. Confused and lost in this strange world she struggles to come to terms with what may have happened to her, and the first side of the narrative is in part driven by this confusion. The second narrative character is Kai. In part his is a fascinating portrait of words, he is a dark and strange viewpoint which belongs to one who knows all the secrets and so does not feel the need to share them. Leaving you feeling his narrative washes over you, alluding to possibilities as much by what he does not say as by what he does. His perspectives and insights into the characters that inhabit Immortown all have a shaded twist to them that is at once creepy and gets under your skin. A fine trick of the writers narration. The twin narration slipping between viewpoints offers a complex read, at times, it can become confusing but only in the wonderfully artistic weaves of the words. Pictures painted by them owe much to your imagination, feeding it and playing with it all the same. 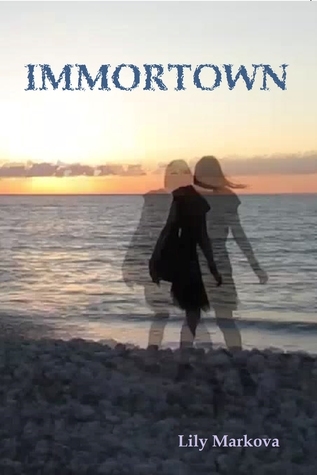 The character of Immortown itself helps set the story out from the average and mundane. It is spooky and yet real in the way only an imaginary place can be. The inhabitants of this strange ghostly town are at once both human and parodies of their living selves. As selfish, and self-absorbed as only humans can be. They exist in an afterlife they are both desperate to leave and yet desperately clinging to all the same. The plot weaves its thread around the narratives, slipping behind you as things come to light that you don’t see coming more because the hints are so carefully crafted. A few words slipped here or there into the narratives take on more significance later in the book. The way a good plot should, without leading you by the nose. In summery it is a less than simple tale, told less than simply, and all the more enjoyably for that.